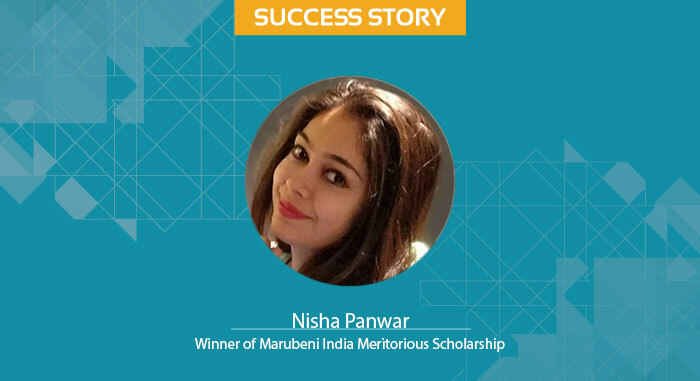 Colin Powell rightly says, “A dream does not become reality through magic; it takes sweat, determination and hard work.” These words hold a great significance in the life of Nisha Panwar, a meritorious and ambitious scholar of Marubeni India Meritorious Scholarship 2018-19. Despite having a single parent since childhood, she has emerged as a tough fighter in every life situation. She has been able to pursue her dream of becoming a CS with all her hard work, dedication and determination. Know more about her journey so far and stay motivated from the excerpts below that have been taken from her interview with Buddy4Study. Buddy4Study: Share with us some experiences of your academic and professional journey. My academic journey so far has been full of ups and downs. I did my early schooling till 3rd standard from Kotdwara, my aunt’s native place after which I moved to Khekra district in Baghpat and joined Gurukul Vidhya Peeth School. Thereafter, I got selected in Jawahar Navodaya Vidyalaya on the basis of my class 10th merit. I completed my class 12th (in Commerce stream) with 89% marks. Although I wanted to join Delhi University for higher education, my family’s financial conditions did not allow me to do so. Thus, I joined B.Com. degree programme at Dr. P D B H Government PG College in Kotdwara. I am also pursuing CS alongside my B.Com. and I have successfully passed my CS foundation exam. Currently, with my third year of B.Com., I am preparing for the CS executive level examination. Buddy4Study: What motivated you to pursue a CS course? Ever since my childhood, I had a strong command over theoretical concepts than calculations and accounting. So, I decided to pursue CS (Company Secretary) programme. I believe pursuing a professional course like CS can help you achieve the greatest heights of success if you are hard working. Buddy4Study: What were the key challenges you come across during the course of your journey till here? As I have already said, my journey so far was full of ups and downs. It involved emotional and painful moments too, which do bring tears in my eyes even today. A family without a father is incomplete. I lost my father when I was 4 years old. My mother is the only earning person in the family. Thus, financial constraints were always there. However, I don’t want to let this phase of my life undermine my ambitions. I still have faith and confidence that my hard work and dedication will definitely take me to my goals. My biggest source of inspiration is my mother, who has always motivated me to achieve my ambitions. Besides her, there was a girl in my neighbourhood, who suggested to me about the CS course when I was in class 11th. She was also preparing for the CS course without any coaching and thus guided me at every step. Her efforts and confidence boosted my confidence and inspired me to head on to pursue the CS programme. Buddy4Study: How has your family supported you in pursuing your academic? Since, I did not have my father, my mother was the only support for me and my brother. She always stood by my side and encouraged me to pursue my aim. Since she works as a helper in an aanganbaadi, her salary was not sufficient enough to even manage the daily household chores. Still, she tried to manage everything on her own without any support from the relatives. I have seen my mother deal with every hardship and never letting anything coming to us. This makes me proud of her and even inspires me a lot. I will never break her trust. Buddy4Study: How did you come to know about the Marubeni India Meritorious Scholarship? What were the steps you followed to avail this scholarship? I came to know about this Marubeni scholarship through Buddy4Study. One day, I was searching for scholarships online and I came across this platform. It carries every information related to scholarships. I contacted their team to inquire about the scholarship. They provided me with every information and suggested me to apply for Marubeni scholarship. I filled the application form online through the portal, after which I went through the telephonic and face-to-face round of interview. Clearing both the rounds filled my heart with immense happiness. I received an email confirming my selection for the scholarship and received the scholarship amount in Delhi. I have won this scholarship for two simultaneous years which has given me the strength to stand firm and face any challenges. I want to become a CS in future and I would do everything it takes to reach there. Buddy4Study: What piece of advice you would like to impart to other potential aspirants like you who are constrained by various challenges towards pursuing higher education? My only piece of advice for all the potential aspirants is that hard work is the key to achieve what you want in life. Have faith in yourself and on God. Rest of the things will get in track with the passage of time. I am very thankful to Marubeni India for recognising my hard work and potential. I have been able to make my mother proud of me. Also, I would like to thank the team of Buddy4Study who have helped me at every stage. Your contribution has changed my life completely. Feeling motivated? If yes, then begin your search for scholarships today and apply for them before their deadline.